Stomu Yamashi’ta progressed from being a teenage musical prodigy in the 1960s to arguably the most famous Japanese person on the planet a decade later. Then he gave it all up and went to meditate in a Kyoto monastery for three years. 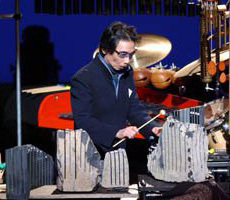 For three decades, the musician that Time magazine once referred to as “the man who has changed the image of percussion” has largely stayed in Kyoto refining his art, refining his life and living in a Zen-like world of sounds and music. At a young age, Yamash’ta’s reputation was established so rapidly that he was in demand the world over from the greatest musicians of his age. His entrée was classical music – he played as a guest with the Kyoto and Osaka Philharmonic Orchestras at the age of 14 – but his musical mind quickly absorbed everything around it, be it jazz, avant garde, rock or the abstract. 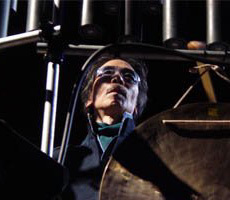 He defined the role of the solo percussionist and started to improvise and compose, contributing to the soundtracks of movies such as “The Tale of Zatoichi,” “The Man Who Fell to Earth” and “The Devils.” He moved through avant garde to jazz before establishing the Red Buddha Theatre Company to showcase his idea of sounds and vision. His most visible work in the rock world came in 1976 when he collaborated on the Go project with huge stars such as Steve Winwood (Traffic), Phil Manzanera (Roxy Music), Mike Shrieve (Santana), Klaus Schulze (Can) and Al Di Meola (Return to Forever). Yamash’ta had transformed himself from a classical teenage prodigy into a global rock star. Then he gave it all up, returned to Kyoto and stayed at a monastery for three years. “I came back from Europe when I was at my peak, and many people wondered why I quit and came back to a Buddhist temple, suspending – almost giving up – my career,” Yamash’ta recalls. “I thought I should give up to become zero again, to get hungry again. As if by fate, he learned of a stone with amazing sonic properties that was found in the mountains of Kagawa Prefecture on Shikoku Island. But Yamash’ta doesn’t reject society. Far from it. He is more outgoing than some might think. He may think a lot and meditate a lot, but he laughs a lot and enjoys good company. It’s easy to see that talking – communicating – puts a sparkle in his eye. “Now, I feel like maybe I’m at my final stage, so from now it’s more like my mission – or whatever I can do – to communicate, to make some kind of function to create a better beauty, and this beauty can lead to a new ‘garden,’ ” he says. His musical endeavours over the last quarter of a century have revolved around bringing the Sanukite stones to life. Anyone can bang a drum, but breathing life into inanimate objects takes a belief that the objects really do possess life and power. Yamash’ta caresses his stones and communicates with his stones as if they are alive. For him, they are. They possess life – in their unique sounds and their 20-million-year history. Yamash’ta the percussionist is not a member of a band or orchestra; he does not beat time to someone else’s rhythm. He does not beat time, period. He is a channeler of sounds. He discovers the sounds of the stones. They are not his sounds; they are the stones’ sounds. “The Void” is a journey through history, through life, and a message of peace and hope for the future. Yamash’ta worries about the younger generation and wishes they could find the awakening that he has experienced over the last three decades. “Compared to our age, young people have a more established education,” he explains. “They have more information, but being young, the tragedy is they have not had enough experiences that could create a new dimension, and to face a new consciousness; you need knowledge to overcome. You have to filter knowledge through experience. And maybe this is one reason why young people are becoming so inward-looking today. Yamash’ta is no fool, but he has the spirit of a fool – the fool of Shakespearean literature, a fool that has more wisdom than those around him, but which is not always obvious. As in meditation, sometimes you have to close your eyes to see the light. This entry was posted on Tuesday, October 30th, 2012 at 10:36 amand is filed under . You can follow any responses to this entry through the RSS 2.0 feed. You can leave a response, or trackback from your own site.